Awaking the next morning we started hiking up the switchbacking trail towards Shelf and Moon Lakes. It was short but steep, something I'd rather have then the long flat approaches we did previously. In only a couple hours we made it to Shelf Lake and set up camp. We quickly made up our day packs and hiked the easy grassy terrain to Moon Lake and began ascending orange talus up Mount Rearguard. As we gained elevation the impressive east face of Spirit Mountain was inspiring and I wondered if anyone had ever climbed it before. I also noticed an awesome NE couloir on Spirit that looked like a great snow route to climb but it was too late then. After an hour of grueling talus slogging we crested the west ridge of Mount Rearguard but just in time for a storm to roll in (man this place sure is stormy). We found a nice cave-like rock to hide under for a half hour before making the rest of the easy ascent to the summit. The summit area of Rearguard was very interesting since there were a couple 5th class towers but the highest point was an easy class 2 walk up. We descended down the Hellroaring Plateau which was an easy grassy and talus walk for quite a ways. When we got to the edge of the plateau just above Shelf Lake we descended a very loose pile of crap talus and scree slope back to the lake and pulled out the fishing rod. Just as we got back to the tent though it began raining (whew). That would have sucked if we were still on the plateau! So we waited out the storm and we noticed it get considerably colder. We managed to catch and cook one fish because it got so chilly. We did have a spectacular sunset though after the storm. When we got up the next day we were treated to a beautiful sunrise. We hiked the grassy terrain to Moon Lake again but this time cut left since the plan was to climb Spirit Mountain. The lupine wildflowers were beautiful in the morning sun. We crossed the Moon Lake outlet stream and ascended a grassy slope to a small tarn and traversed around and above Frosty Lake. This area had lots of loose rock but we crossed over a small rib and hit the south slopes snow route. We put the crampons on and began climbing the snow which was moderate at first and stayed around 35-40 degrees nearly the whole way up but closer to the top it got steep and we actually had to cut right off the snow to climb rock so we could get above the massive cornice guarding the top. This short third class rock scramble was some of the loosest crap I've ever been on. Once we made the summit plateau we walked a short ways east to the highest point. Views of Mount Rearguard were beautiful and a thin but low cloud deck made for a cool but stable day. We had a nice break at the top and began the traverse to Forget Me Not Mountain. This was a long talus slog atop desolate plateaus. Stephan mentioned all these summit plateaus we were walking on were god forsaken places and I could only imagine how horrid they would be in the middle of winter. We descended to the broad saddle between the two peaks and hiked up to what we thought was the highest rock on Forget Me Not Mountain. The summit area was so huge it was hard to determine what the highest point was. Regardless though the view off the north face was one of the best drop offs I have ever seen. Views of the Bears Tooth and Beartooth Mountain as well as our entire route up from Black Canyon Lake were clearly visible. What a place to reflect this was. After a long time to think and reflect, we made the trip back to Shelf Lake (which involved a bomber glissade down the snow slope) and hiked out to the car. The drive back out the long road seemed to take forever since we so looking forward to food in Red Lodge so much. Once returning to town bikes still lined all the streets and we snagged a great dinner at another local eatery and finished it off with fantastic ice cream at the Scoops Diner. Part one of our Montana project was complete. We summitted eight of the 26 ranked 12ers in the southeastern portion of the Beartooth Mountains. We were well on our way and still had lots of fun and exploring to do. Please stay tuned for part 2 of my Montana 12ers project which will describe our climbs of the Granite Peak area and the Castle group. There will also be a part 3 coming out next year which will describe the peaks we didn't have time to get this past summer including the Wood group in the northern margin of the mountain range. Thanks for reading and I hope you enjoyed the photos! Spirit Mountain is a beautiful peak located in the Beartooth Mountains of South-Central Montana. It is one of Montana's 27 ranked peaks which rise over 12,000 feet, coming in at number 17. A variety of moderate to difficult snow and ice climbs can be found on the North, East, and South sides of the peak from late fall to early summer. A couple of these routes, including the permanent snow fields leading up the South Face from Frosty Lake and the ones coming up from the Black Canyon Drainage between Spirit Mountain and Peak 12,115 (aka. Drop Off Mountain) can be climbed year round. The standard approach for Spirit Mountain is one of the shortest approaches to a 12,000 foot peak in the Beartooths when the Rock Creek Road is open. The incredible scenery of the area is due principally to the action of glaciation beginning about 1.6 million years ago which carved out the large glacial valleys from the immense high plateau of the Beartooth Uplift. In the process, several high, flat topped peaks which were not completely affected by the glaciation were left behind which dominate the summit views from Spirit Mountain. The climbing potential on this peak is probably one of the best is the entire Beartooth Mountain range. The east face is one of the biggest mountain faces in the state of Montana and offers ambitious climbers plenty of first or second ascent potential. One feature in particular is the deep cleft bisecting the east face offering very steep snow/ice/mixed climbing in the spring and fall. It is one thing to try to overthrow the official name of a peak, but in this case it seems that the Salo family may not know which peak is indeed named after them. Peak 12,250+, commonly known as Salo Mountain, and now more often called Darlene Mountain is located approximately 0.6 miles WSW of Castle Rock Mountain, or over 7 Miles Northwest of the plaque atop Spirit Mountain. Since then though, the plaque was removed on August 29th, 2005. The USFS has policies against unauthorized placement of plaques and other mementos in wilderness areas. The plaque was clearly not authorized, and was removed by an anonymous party. In response to an E-mail to the Custer National Forest questioning their policies, I got a call from a ranger who would have hiked in and removed it herself. She was glad to be notified, as the ranger district was not aware of the plaque's existence. She commented that if people find similar mementos, they should let the appropriate national forest know and they will send someone to remove them (or you can remove them yourselves). It should be pretty obvious if a plaque is official, and there are very few such memorials in Wilderness areas. Thanks to member Brice Neugebauer for the information in this section. This is the standard trailhead for Spirit Mountain and the one used for the Standard South Ridge route, the South Slopes route and potential routes on the East Face. This approach can also be used for the Northwest Ridge and Dark Moon Couloir routes. From the Montana Road 308 and US Highway 212 junction in Red Lodge, go west on US 212 for 11.4 miles and turn right onto FS 2421 (Rock Creek Road) and measure from this point. Follow this paved road for 0.9 miles where it turns to dirt and passing by three National Forest campgrounds. Here the road forks, take the left fork and continue on the good dirt and pass the M-K Campground at mile 2.8. Here the road becomes rougher. Continue 8 miles on this road as it drops into Wyoming and reaches the trailhead at the Montana/Wyoming state boundary at 8,700 feet. This road is passable for tough passenger cars with good ground clearance. There are many good places to pull off and camp. Use this trailhead for approaching the north side of Spirit Mountain which includes potential routes on the north face and possibly the Northwest Ridge and Dark Moon Couloir (although it's shorter to use the Rock Creek Trailhead). From the Montana State 308 and US Highway 212 junction in Red Lodge, go 10.8 miles west on US 212 towards Beartooth Pass and turn right onto the Lake Fork Road. Go 1.8 miles on this paved road to its end at the trailhead with ample parking. The elevation at this trailhead is 7200 feet. This is one of the shortest approaches to any 12,000 foot peak in the Beartooth Mountains and the standard approach for Spirit Mountain. There are two variations for this approach based on which route you want to do. For the Standard South Ridge Route it's very easy. Simply hike the very well defined Glacier Lake Trail for 2 miles to Glacier Lake. This is a very popular day hike in the summer among families and fishermen. For any other route on the peak except the North Face, use this variation which heads up to the Shelf and Moon Lakes basin. From the Rock Creek trailhead, begin up the steep switch-backing trail through an old burn area and reach a nice footbridge crossing Rock Creek after 0.6 mile at 9,080 feet. Cross the bridge and continue up the trail for eight more switchbacks and locate a side trail heading off to the right (north) at 9,230 feet, a quarter mile from the bridge. There may a cairn here to mark the turnoff but don't expect one. Follow this steep but well traveled boot path along the left (west) side of this side creek for 0.35 mile to where it crosses back to the east side of the creek on large boulders at 9,600 feet. Past this crossing the slope eases and the path continues through open grass above and on the right side of the creek. The trail can be hard to follow at times but follow it to a small tarn at 9,850 feet where it once again crosses the creek back to the west side. Continue up another couple hundred feet on open grass to Shelf Lake which makes an excellent place to camp or continue around the left (west) side of Shelf Lake and continue northwest over a large, broad grassy bench for 1.2 miles to the southwest corner of Moon Lake where you can also camp. It's about 3.2 miles from the Rock Creek Trailhead to Moon Lake with slightly over 1,500 feet of elevation gain. This approach is much longer and more tedious but makes for a more scenic tour. From the Lake Fork Rock Creek trailhead, follow the trail along the south side of the creek for 4.7 miles to the junction with the Lost Lake trail. This spur trail leads 0.2 miles to Lost Lake with good camping, but poor fishing. Lost Lake sees a lot of day hikers so don’t expect much solitude here. Continue past the junction 0.3 miles to the nice foot bridge crossing the Lake Fork at 8440 feet. Do not cross the bridge but locate another trail to the left heading south towards Black Canyon Lake. This boot path starts out nice as it passes by some great camping areas but quickly degrades after 0.2 miles. Follow this trail as it weaves through the trees and is often muddy. It can be difficult to follow but it’s worn in enough to locate. When the trail meets Black Canyon Creek, it follows on its left (southeast) side along the rim of the small gorge for 0.2 miles to where the canyon opens up. It is best to cross the creek here on large boulders and catch the path on the northwest side of the creek as it heads through trees for a quarter mile to the base of the head wall at the upper end of the valley. Don’t switchback up to the left on the talus. This just ends and leaves you a lot of rock hopping above the valley bottom on very large rocks. At the head of the valley, the creek disappears under large talus and cairns mark the trail up the head wall to the left (south) in an avalanche chute and around large talus blocks reaching the north end of Black Canyon Lake, at 9220 feet, after another quarter mile. This point is two miles from the Lake Fork Trail. Camping at Black Canyon Lake is sparse but the fishing is superb with very large Yellowstone Cutthroat trout. This route is simple and offers a beautiful peak hike requiring no special gear in summer. Use the Glacier Lake Trail approach and hike on faint boot paths around the right (north) side of Glacier Lake and continue around the south side of Triangle Lake to Sheep Lake at 10,040 feet. Begin hiking up the rib to the west (left) side of Sheep Lake towards the broad south ridge. Reach the ridge around 11,400 feet and hike 2 miles northward along the easy boulder covered ridge/plateau to the summit. This route is 13-14 miles round-trip and makes an excellent full day hike. In early season when the snow coverage is good, instead of hiking all the way to the saddle at the base of the Northwest Ridge, veer left (west) into the steep couloir 200 feet before reaching the 11,250 foot col. Climb the steep, 50 degree couloir for 1,200 feet to the end of the couloir which dumps you on the summit plateau where a short hike south across the plateau takes you to the summit. Be aware that rocks and ice fall down this couloir quite a bit when the warm sun is shining. From Black Canyon Lake, hike around the left (SE) side of the lake on rough talus for 1.2 miles staying close to the shore where you may occasionally find a small trail. At the south end of the lake there area couple places to camp. Cross the inlet stream and continue on the right side of the stream up the valley on rough talus or easy snow for 1.5 miles and reach an elevated bench above the valley bottom at 10,200 feet, passing below the Bears Tooth along the way. The intent of this section is to avoid the terminus of the huge rock glacier. Descend 100 feet or so due south passing a tiny tarn at 10,060. Aim for the huge slope leading to the col between Spirit Mountain and Drop-Off Mountain (AKA Forget-Me-Not Mountain). Climb south for 1,700 feet of loose talus or moderate snow (preferred) to the col at 11,720 feet. From the col, it's a very easy hike to the east for 0.75 mile along the plateau boulders to the summit. There is a couple 10-15 foot high rocks on the plateau you'll pass by. This face is one of the most prominent big faces in the Beartooths and offers abundant climbing potential. Lunar Arete Route Beta coming soon! Summer climbing season is short in Montana. Late July through early September are the months that are most snow-free. However, expect some snow on the mountain any time of the year. Expect any type of weather any time of the year. Violent thunderstorms are a common daily occurrence. Get an early start to avoid afternoon thunderstorms. Storms develop very fast and tend to come from the south or west. Spirit Mountain can be climbed in the winter from either drainage. The road up the Lake Fork valley is closed with a gate approximately 0.5 miles from highway 212 in the winter. The road up Rock Creek, however, is never officially closed. Depending on snow conditions, your vehicle, and your nerves you may be able to get within two or three miles of the trailhead. You are advised to contact the Beartooth Ranger Station at (406) 446-2103 for the latest conditions and road closure information. Camping is allowed anywhere within the Absaroka-Beartooth Wilderness. You are "requested" to check in with the Beartooth Ranger Station in Red Lodge or call (406) 446-2103 before camping in the back-country (although most people do not bother). You must have a permit to cut live trees for firewood. There are several campgrounds along the first paved, then graveled road leading up the Rock Creek drainage. The last official campground (M-K) is four miles from the highway, but additional good dispersed camping spots can be found along the deteriorating road to and including the trailhead. No car-camping areas are available in the Lake Fork Drainage. There is no red tape! Mount Rearguard is the highest point on the massive Hellroaring Plateau in Montana's Beartooth Mountain Range, and one of only 27 ranked peaks in the state to rise over 12,000 feet. The peak can be accessed from a number of different directions, with the easiest routes being nothing more than an off trail hike. Excellent ski descents can be found from Rearguard during the Winter and Spring months. Mount Rearguard made the news in August of 1998, when a small aircraft crashed into the western slopes of the mountain at approximately 11,900 feet, killing the pilot. The plane was thought to be traveling from Wells Nevada to Minot North Dakota. This is the standard trailhead for the Spirit Mountain group which includes Mount Rearguard. From the Montana Road 308 and US Highway 212 junction in Red Lodge, go west on US 212 for 11.4 miles and turn right onto FS 2421 (Rock Creek Road) and measure from this point. Follow this paved road for 0.9 miles where it turns to dirt and passing by three National Forest campgrounds. Here the road forks, take the left fork and continue on the good dirt and pass the M-K Campground at mile 2.8. Here the road becomes rougher. Continue 8 miles on this road as it drops into Wyoming and reaches the trailhead at the Montana/Wyoming state boundary at 8,700 feet. This road is passable for tough passenger cars with good ground clearance. There are many good places to pull off and camp. This is one of the shortest approaches to any 12,000 foot peak in the Beartooth Mountains. From the Rock Creek trailhead, begin up the steep switchbacking trail through an old burn area and reach a nice footbridge crossing Rock Creek after 0.6 mile at 9,080 feet. Cross the bridge and continue up the trail for eight more switchbacks and locate a side trail heading off to the right (north) at 9,230 feet. There may be a cairn here to mark the turnoff. Follow this steep but well traveled boot path along the left (west) side of Rock Creek for 0.35 mile to where it crosses back to the east side of the creek on large boulders at 9,600 feet. Past this crossing the slope eases and the path continues through open grass above and on the right side of the creek. Continue to a small tarn at 9,820 feet and cross the stream again just below it. Follow the path around the left side of the tarn and pass a very shallow second tarn. Cross back to the other side of the stream and ascend 250 feet along the stream draining Shelf Lake and reach the southwest arm of the large lake at 10,200 feet. Fantastic camping and fishing is found at Shelf Lake. This is the standard route for Mount Rearguard and also is one of the few routes up one of the 12,000 foot peaks that is more feasible as a day hike. Use the Rock Creek Approach and locate the easy slopes about a quarter mile before the tarn at 9,850 feet. Begin hiking northeast up the grassy slopes and after 0.5 mile reach Point 10,670 where the terrain becomes flat. You are now on the Hellroaring Plateau. If there is any hint of bad weather, it’s best to turn around. Walk north on grass across a flat bench and continue hiking up to 11,100 feet to the next flat bench, 0.5 mile from Point 10,670. Traverse on grass around a couple unnamed points to the right (northeast) staying at the 11,100 foot contour for 1.1 miles. When the slope steepens again, climb 0.8 mile north up large talus blocks to the summit. Sliderock Lake can be seen to the east and is a spectacular sight. Use the Rock Creek approach and hike 1.9 miles to Shelf Lake. From the south end of the lake, hike around its left (west) side on grass and cross its outlet stream. Continue north over a large broad grassy bench with pleasant hiking and reach the southeast corner of Moon Lake after 1.3 miles at 10,400 feet. Walk around the right (east and north) sides of the lake and continue a short ways up the valley to 10,500 feet and locate a large, orange colored talus slope to the right (north) which is 0.7 mile from the southeast corner. Climb this 1,100 foot slope to the north staying to the right side on more solid rock. Reach a small saddle at 11,590. From here turn right and head up the broad west ridge on talus and reach the summit plateau where the slope eases at 11,830 feet. Hike east on boulders across the plateau for 0.5 mile to the summit which is the southernmost point. The rock towers just to the north are actually quite technical and offer a nice challenge for some added adventure. The views of Spirit Mountain’s east face are stunning. Descend either the way you came or make a loop and descend the standard South Slopes. This is a real adventure route offering a challenging, alpine rock climb on the flanks of the Hellroaring Plateau above Hairpin Lake. 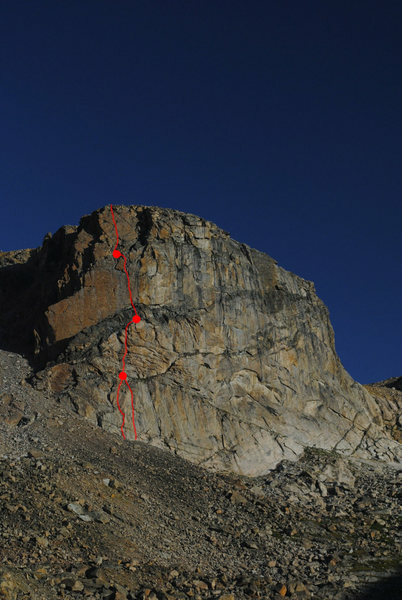 It's hard to determine how many ascents this route has seen but it it probably less than 10. The approach begins at the Hellroaring Plateau Trailhead reached by a 9 mile long 4WD road that starts shortly after the pavement ends on the Rock Creek Road. Instead of turning left to stay on the road following Rock Creek, continue straight and follow the rougher road as it climbs steadily and switchbacks up above treeline reaching the plateau. At the end of the road 10 miles from Highway 212, there is a trail that heads west. Follow this trail for about 1 mile where you will be able to clearly see Hairpin Lake and the Hairpin Buttress to the north. Descend north and traverse across the valley, passing Snowbank Lake on the way to Hairpin Lake. Stay on the left side of Hairpin Lake and low on the talus field. Follow grassy meadows up the hill and navigate the talus field to the base of the climb. The climb starts on the left side of the wall about 4 miles from the trailhead. Begin climbing up the obvious right facing crack on easy stacked boulders to a flaring offwidth. Pass this offwidth section and move right below a roof where you'll find good gear. Continue left of the roof to a good belay ledge below the roof. A 5.9 variation climb starts 15 feet to the left of the 5.10b start. Follow a left facing crack to an intermittent flake system to a right facing flake with decent but tricky gear and finish on the same belay ledge. This first pitch has a PG-13 protection rating for either variation. Start to the right of the big roof below an inverted staircase type feature. Start on a difficult move with good gear to a ledge. Continue up the broken face to a left facing hand crack to an offwidth. Belay off a good ledge at the base of a huge basaltic sill. Gain an obvious splitter crack just above the belay ledge and climb through the roof to a dihedral then pull the dihedral to another splitter finger-thin hands crack. Follow the crack until it ends then escape right of the roof and follow interesting pinches to yet another bodacious ledge where you can set up a belay. Climb out of the belay ledge and wander right to an obvious vertical broken hand crack with good gear. Loose rocks are unavoidable so wear helmets! Top out and belay from the boulder field. Descend by either hiking north along the top of the formation and down the rib with a glacial lake to the left and the Hairpin Lake valley to the right. This rib has some fun scrambling and exposure. Reach the outlet stream and follow along it down moderate slabs and talus back to the north end of Hairpin Lake. This descent is shown on the map below as the dashed red line. Camping is allowed anywhere within the Absaroka-Beartooth Wilderness. There are several excellent camping spots accessible by car along the Rock Creek Road in addition to the official National Forest campgrounds. Great backcountry camping is also found at Shelf Lake and Moon Lake. Mount Rearguard is located in the Absaroka-Beartooth Wilderness, which is part of the Custer National Forest. No fees are required to climb or camp. No mechanized vehicles are allowed and practice leave no trace. Summer climbing season is short in Montana with the best time to climb being late July through early September. However, expect some snow on the mountain any time of the year and expect any type of weather. Violent thunderstorms are a common daily occurrence and these storms can also drop snow in August so come prepared with rain gear and insulating clothing. Get an early start to avoid afternoon thunderstorms as they develop very fast and tend to come from the south or west. Rearguard can be climbed in the winter from either the Rock Creek or Lake Fork drainage. The Lake Fork Road is closed with a gate about 0.5 miles from Highway 212 in the winter. The road up Rock Creek is never officially closed however in mid-winter, it is likely covered in enough snow to require a snowmobile. Depending on snow conditions though you may be able to get within two or three miles of the trailhead especially in late fall or early winter. You are advised to contact the Beartooth Ranger Station at (406) 446-2103 for the latest conditions and road closure information.